The Raspberry Pi Wobbulator PCB is shown below. 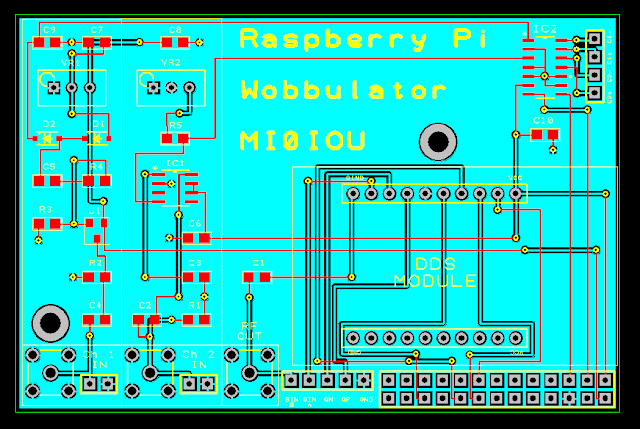 The PCB is double sided and is designed to be mounted directly above the Raspberry Pi motherboard. It was designed using DesignSpark PCB (which is available free from RS Components) and an initial batch of PCBs is currently being manufactured. I hope to take delivery of them some time around Christmas or the New Year. I hope to make the PCB available on its own, or along with a kit of components for home assembly. I'm currently working on sourcing the various components at the best price possible. The bare PCB on its own will be £12 (£10 + VAT) and this price will include free delivery within the UK. Worldwide delivery is available at a small additional cost depending on your location. I'm still working on putting together the best deal I can for the kit of components. For the latest information on possible delivery date and pricing I would suggest that you join the rpiwobbulator Yahoo Group. I will be posting up to date information on delivery and pricing as it becomes available on the Yahoo Group rather than on this blog, but you can of course contact me directly if you wish via email.